Space, the final frontier, with this pictorial journey we will boldly go where only lucky astronauts and the immense reach of a camera lens have gone before. We will gaze in wonder at some stellar sights, feeling very small in comparison to the vast expanse of space and very proud to be part of a race that has reached out from their humble position to the outer limits of the galaxy. A magisterial space rocket lifts off from planet Earth on its mission to outer space. The Columbia Space Shuttle heads for space with all its cylinders blazing. A beautiful shot of our planet Earth in all her glory. A vertiginous view of the Antarctic Peninsula seen from outer space. Autumnal colours surround Lake Superior snapped from space. Fires photographed from way above North-Eastern Australia. Low pressure builds and swirls over the Great Lakes of America. The wondrous green and red aurora caused by charged particles from a solar wind clashing with oxygen. A super shot of Typhoon Roke heading for Japan taken from the NASA Goddard Space Flight Centre. Cloud vortices curl and curve above Heard Island in the Indian Ocean. NASA’s Upper Atmosphere Research Satellite (UARS) orbits the Earth before it plummeted down into the Pacific Ocean on 24 September 2011. A lovely lunar video capturing the pockmarked surface of our shadowy satellite. A wonderful video of a lunar landscape flyover. An immense solar flare roars from the surface of the sun in this stunning image of the centre of our solar system. The temperature of the Sun’s surface is around 6000 Celsius. In this photo, a fiery flare from it leaps into space. The awesome might of the solar surface and a stunning sun spot. A chiaroscuro eclipse is even more stunning when seen from space. A beautiful shot of Mercury’s moon-like surface, craggy and scorched by the Sun. Favourite of science fiction writers, Mars is just as incredible in reality. A mesmerising sight, Saturn and its majestic rings. The biggest of the gas giants and largest planet in our solar system. 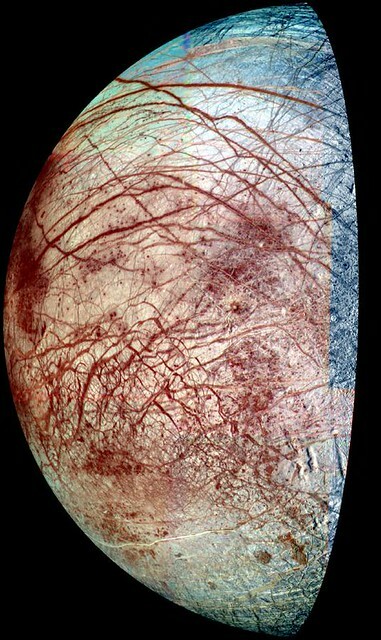 One of Jupiter’s moons, Europa has ice and water on its surface, which has led to speculation about whether it can or does sustain life. Another gas giant, Uranus was the first planet found by telescope. Initially Neptune’s existence was predicted by mathematics, before telescopes became powerful enough to view him. Images of the icy dwarf planet from the Hubble Space Telescope. A stunningly detailed photograph of the Andromeda Galaxy, approximately 2.5 light years away. A magnificent spiralling disc of stars in the far off galaxy NGC 2841, captured by the Hubble Space Telescope. Incredible imagery of a black hole as it spews jets into the cosmos. The mysterious centre of a black hole as it emits bright light. The route to another dimension? This list of galactic images was compiled and written by PrinterInks – suppliers of top brand printer cartridges, including Dell, Samsung, HP, Canon and Epson ink cartridges. Each of the images and videos used in this post are, at the time of posting, held under the Creative Commons licensing.